Everyone (I think) has, among the clutter of childhood memories, a few that really stand out. One of mine is the tour of Alcatraz I took with my family when I was 11. Two things in particular stand out in my mind: first, that my brother did the entire tour – which involved something like a hundred stairs – on crutches, and second, the tour guide put the entire group into a solitary confinement cell and closed the door. Being shut in a tiny, pitch-dark room where we had just been told prisoners were sent naked pretty much ensured the entire remainder of my life being spent on the straight-and-narrow. Though I never went into full-on obsession mode with Alcatraz the way I have with other things (like Tudor England, the Salem Witch Trials, and the Civil War), I’ve always remained interested in it and have seen more than a few movies and such about it. (Heck, I violated my “No Nicholas Cage movies ever!” rule to see the movie from which I stole this post’s title.) 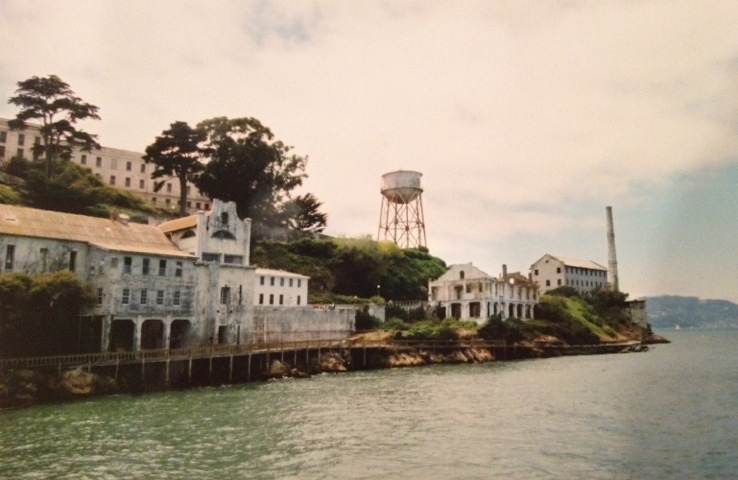 I even visited Alcatraz a second time about 10 years ago when I was in San Francisco for a work trip. I found it disappointing, however, because the guide-led tour I remembered from childhood had been replaced with audio headsets and seemed to cover much less of the prison that I remembered, and most definitely did not include a closed-door view of a solitary confinement cell. At any rate, it should come as no surprise at this point that I decided to record new show “Alcatraz” that started a couple of weeks back. I didn’t know much about it other than it was about a place that I’d been interested in for most of my life, and it was produced by JJ Abrams, who also created LOST, one of my all-time favorites. Oh, and that it was crime show with some sort of sci-fi element. I’m not sure how it took until the third day of my being an invalid before I remembered to check the DVR, but I did this evening and promptly settled in to watch the three hours of “Alcatraz” I found there – the two-hour premiere and last week’s episode. And I gotta say, I liked it. I mean, it was no Downton Abbey, but if you like crime shows (which I do) and have a fondness for the convoluted, may-never-pay-off mystery stylings of JJ Abrams (which I also do), then it’s definitely enjoyable to watch. The basic premise is that in 1963, when Alcatraz closed, everyone there – guards and prisoners – vanished and were not transferred to other federal prisons as was supposed to happen. Fast-forward to 2012, and the prisoners are re-appearing and committing new crimes… And are still at the ages they were in 1963. They’re being pursued by Sam Neill channeling Tommy Lee Jones in “Men in Black,” Hugo from LOST, and a female cop who apparently isn’t Jennifer Morrison but looks just like her. Oh, and when they catch them, they get re-incarcerated in a shiny-new faux-Alcatraz. OK, that makes it sound fairly terrible. But really, once you surrender to the obvious unreality of it, and commit to the old “suspension of disbelief” it’s pretty good. Or at least I like it, but then, Alcatraz was imprinted on my imagination at a very young age. Arriving at Alcatraz for the second time, in 2001. Next Article OMG, Instant Cake! Alcatraz is awesome. My biggest memory of the place is the wind. Since the island is in “the slot” – the place where wind blows in from the Pacific under the golden gate, the wind is always there and it howls! Yep; we definitely went in 1981, but I don’t actually have any photos of Alcatraz from that trip, though there is one of all of us on the boat ride. This photo is from the second time I went, in 2001. I’ll update the caption to make that clearer. Well, that explains why the picture is so good. You certainly had a MUCH better camera 10 years ago than we did 30 years ago!